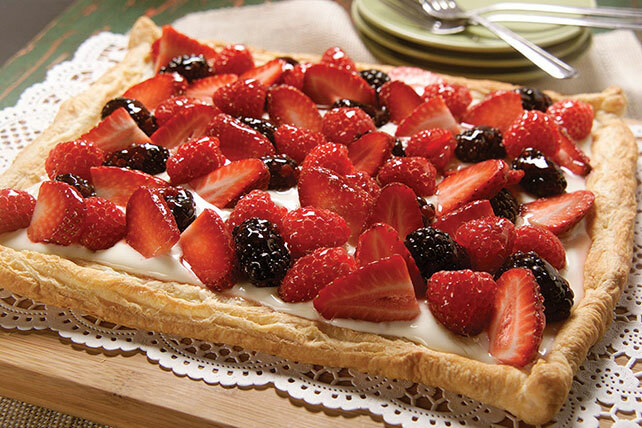 Make your day more colorful with our Berry Fruit Tart recipe. Fresh blackberries, raspberries and sliced strawberries combine delightfully with cream cheese and puff pastry in our Berry Fruit Tart. Unfold pastry on lightly floured surface; roll into 14x10-inch rectangle with rolling pin. Transfer to large baking sheet; brush edges with water. Fold over 1/2 inch around all sides, then press firmly onto bottom of pastry to form rim. Pierce bottom of pastry in several places with fork. Bake 15 min. or until golden brown, breaking any large air bubbles with fork after 10 min. Transfer pastry to wire rack; cool completely. Beat cream cheese, sugar and apple juice until blended; spread onto pastry. Top with berries. Brush melted jelly over fruit just before serving.